The South Downs, The Weald & Hickstead make Horse Riding In Sussex a must do. Sussex is a beautiful place and has a wide variety of landscapes perfect for horse riding. From coastal plains and beaches, to the South Downs and The Weald its forests and miles of bridleways. The 160 kilometre long South Downs Way follows old routes and droveways along the chalk escarpment and ridges of the South Downs. Horse riders walkers and cyclists share the South Downs trail. For experienced riders the South Downs Way is a very enjoyable ride, it provides the ooportunity for an extended journey on horseback. However your horse will need to cross some busy roads. Sussex is home to Goodwood, Fontwell Park, Brighton and Plumpton race courses and the ‘All England Jumping Course’, at Hickstead is situated just 8 miles north of Brighton and Hove. Dogwood Tack Shop is based in Strettington, near Chichester, West Sussex. 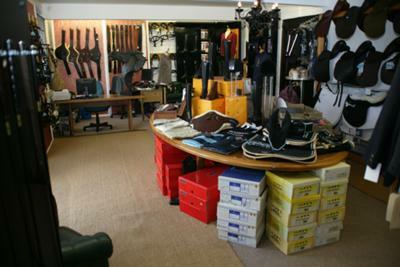 We are a specialist retailer of Italian riding boots and stock brands such as Sergio Grasso, De Niro and Brogini.